Graph Search is an experimental search functionality for Facebook users. It is only active for few Facebook users and had mixed response from users. It is more interactive and different from usual Facebook search. However, once Graph Search is activated for your Facebook account – lot of things change in the user interface like: the top blue Facebook bar becomes search bar and notifications icons appear at far right. Experimental Graph Search feature is not activated for everyone on Facebook and there is no direct way to disable this Graph search. Since Graph Search changes users interface, it can very irritating for users not liking change in their usual Facebook experience. Fortunately, there is a work around (as explained below) to get rid of Graph search from Facebook account. 1. Open your Facebook profile and scroll to the bottom. Then click on English (US) option to open “Select Your Language” page. 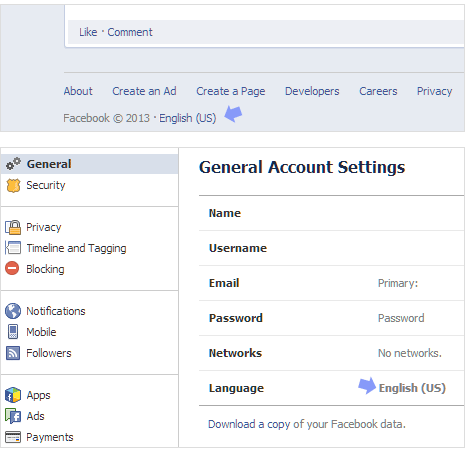 Alternatively, you can open facebook.com/settings webpage and look for language settings at the bottom. 2. Click to select English (UK) instead of current English (US). Then logout, delete internet history and login again into Facebook account – graph search should be gone. 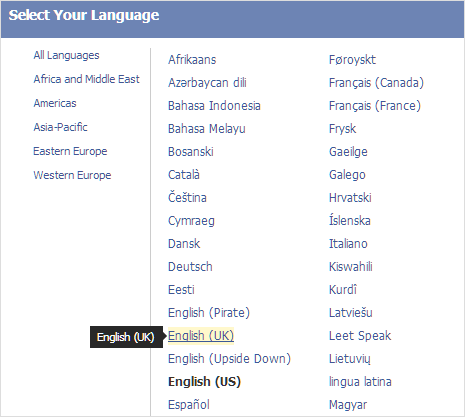 Since Graph search is only available to English (US) users, switching to English (UK) language automatically removes Graph Search feature from your Facebook account. As of now, this is the only working solution to disable and remove new Graph Search feature on Facebook profile. Once you change language settings, your Facebook account will revert back like it was before in terms of looks and functionality.